For 100 years, Nikon has been exploring the possibilities of light and optics. This beautiful collection of 25 pewter pins takes you along on that journey, showcasing seminal camera models like the Nikon Model 1, Nikon F and Nikon D-Series, legendary Nikon binoculars and original company logos. Available in limited quantities, the complete collection includes an exclusive leaflet describing each pin and a display plate with a special metal frame engraved with a limited serial number. It's sure to brighten any Nikon lover's home or office. From the Nikon Model 1 to today's flagship D5, some of Nikon's most legendary models are crafted from handmade dies, bridging three-dimensionality and quality craftsmanship. 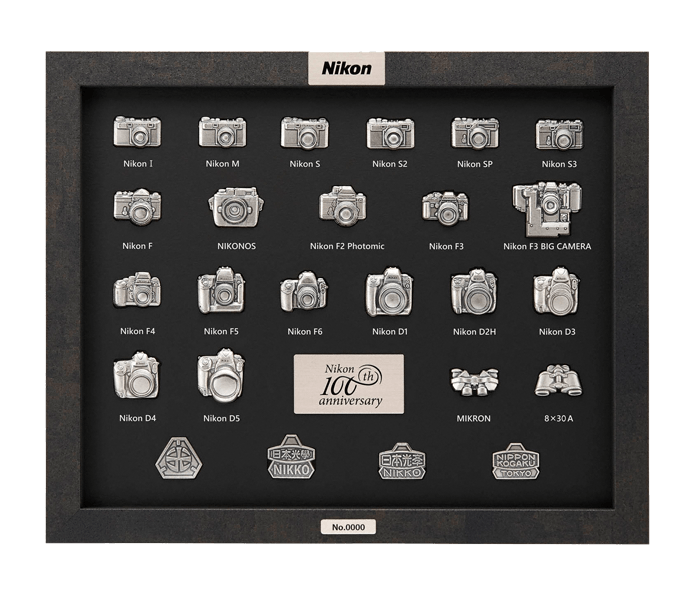 This beautiful collection of 25 pewter pins takes you along Nikon's 100 year journey, showcasing seminal camera models like the Nikon Model 1, Nikon F and Nikon D-Series, legendary Nikon binoculars and original company logos. Available in limited quantities, the complete collection includes an exclusive booklet describing each model and a display plate with a special metal frame engraved with a limited serial number.